My intentions going into the weekend were to launch my Jool exploration expedition, meet up with my local Golem Arcana group, and restart on my multi-tasking experiment. Two out of three isn’t bad right? I ended up playing two Golem Arcana matches using my Dread Vanguard army, winning both so my Ashmogh remains undefeated, and playing a lot of Kerbal Space Program. A lot. Maybe 20 hours worth? I wish Steam showed detailed play statistics. Raptr kind of does, but it’s not as good at that as it used to be. As a matter of fact, if I think about it Raptr is past the point where its usefulness to me outweighs its memory footprint. I should probably find an alternative that just tracks gaming time. The last phase of preparation for my Kerballed Jool exploration mission was to send up the crew and perform some minor structural maintenance. 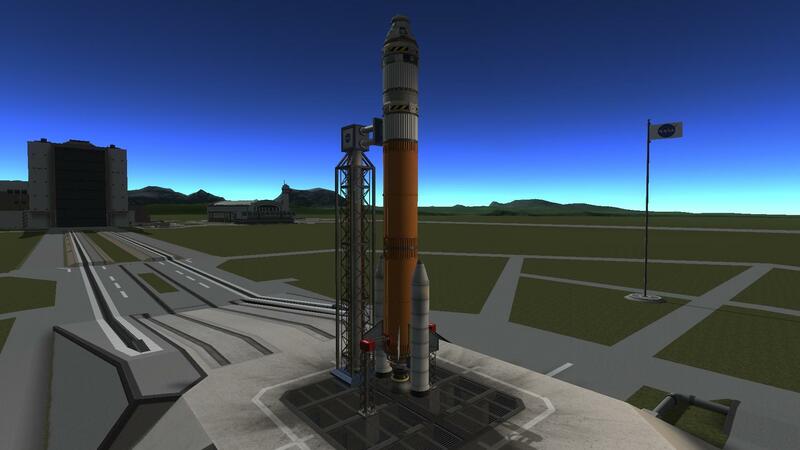 The transfer vehicle was designed to send up a three Kerbal crew, the standard pilot, engineer, and scientist complement. 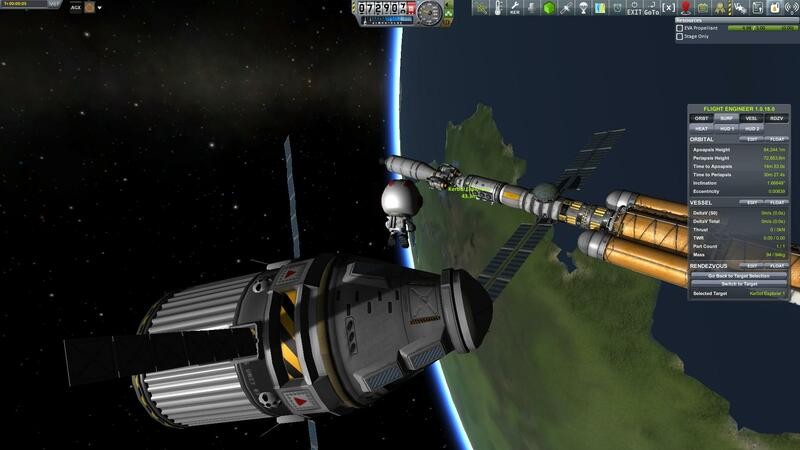 It also had a probe core so that it could be remotely piloted and set to rendezvous and dock with the space station in orbit while the Jool mission was underway, and then be reused to bring the crew back Kerbin-side when they returned. The crew launched at night in order to have the shortest rendezvous with the Jool Explorer 1. That means most of the launch and rendezvous was in the dark so there isn’t much in the way of pictures from that part of the mission. The actual crew transfer took place in the daytime as EVA’s, since there’s only one docking port on the Explorer and it was in use by the lander. 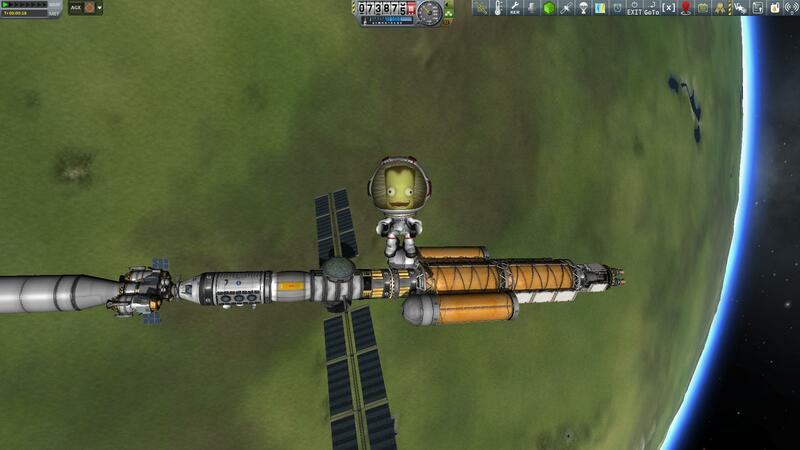 Our pilot, Jebediah Kerman, enjoyed the whole process a little too much. 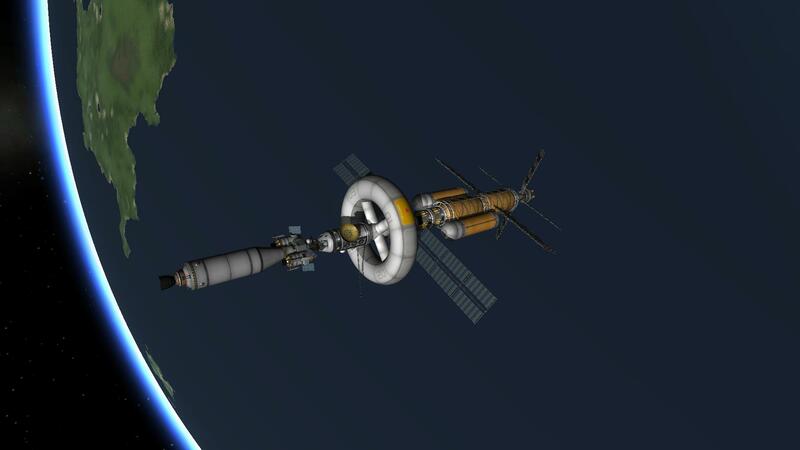 With the crew aboard and some struts applied to the docking connection between the crew and engine modules by the ship’s engineer, Bill Kerman, it was finally time to deploy the habitat ring, heat radiators, and fire up the nuclear reactor. This was my first time using such a large ship as well as a VASIMR engine. With a TWR (thrust to weight ratio) of 0.10 I was expecting it to be slow to get underway, but I wasn’t really prepared for how slow. I was also surprised that the Kerbal Engineer Redux (KER) mod that I use to provide flight details wasn’t working correctly with the VASIMR engine. After plotting a maneuver to transfer from Kerbin to Jool, the built-in numbers were telling me the burn would take 27 minutes while KER was saying 6 minutes and 28 seconds. Sadly KER was wrong. It also meant that I had to break the 27 minute burn down into 4 to 6 minute chunks, which was about the maximum length I could burn at my current altitude without causing my orbit to dip into the atmosphere. 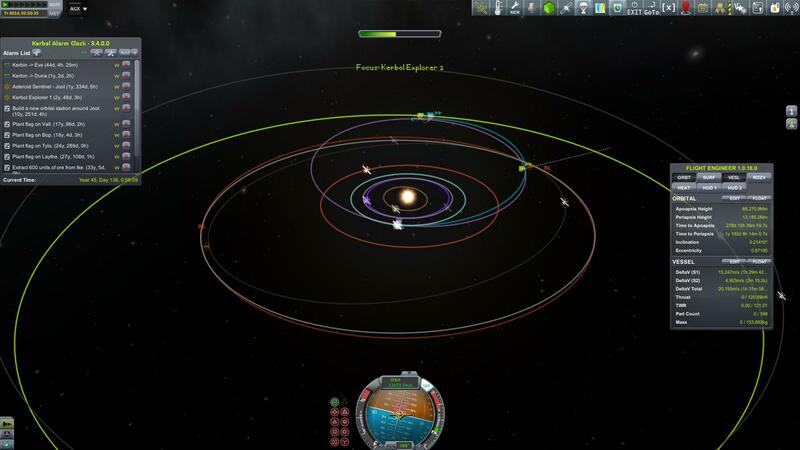 So for about five orbits I would start burning at three minutes before the periapsis (lowest point on my orbit, and the most efficient place to burn from) and keep it up for six minutes total. 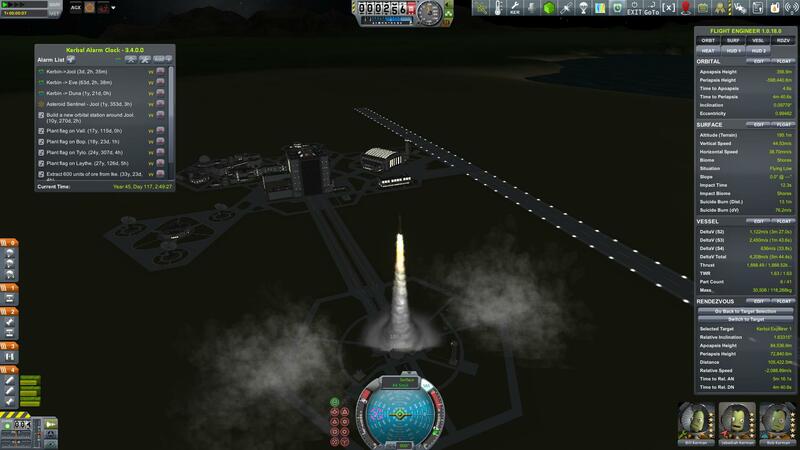 KSP doesn’t allow time warping while a craft is under acceleration either, so I had to do all of the burns in real-time. Well that’s not totally true, KSP does allow for physical warping by a factor of 2, 3, or 4 times but physical time warp can do very bad things to a large craft and I didn’t want to risk it. Eventually the maneuver was completed and my Kerbals were finally on their way to Jool with the trip set to take roughly two years and 48 days.